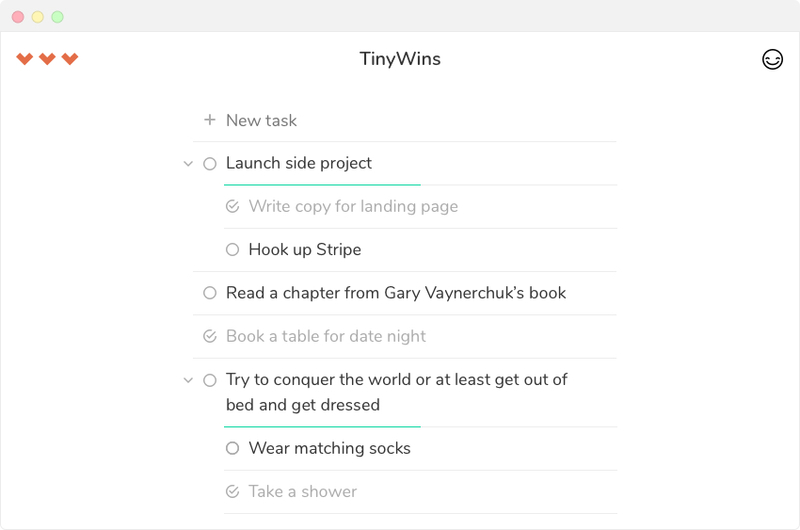 TinyWins is a to-do app that helps busy geeks keep the ball rolling on their tasks and not let them be forgotten. Don’t try to remember all the things you have to get done, save your precious mental energy for more important things like, deciding to eat pizza or a donut for lunch, whether to play Clash Royale or Mobile Strike or what to binge watch next on Netflix. Instead quickly capture all the things you need to get done into TinyWins. Ready for you when you’re ready to start smashing them. We all know you’re not lazy or a procrastinator. Sometimes a task is just so big and daunting . Well, stare that big scary task in the face and smash it into subtasks. Tiny, cute little tasks, so small that you can’t fail in getting them done. Complete a task every 24 hours and you won’t have to pay for TinyWins again.